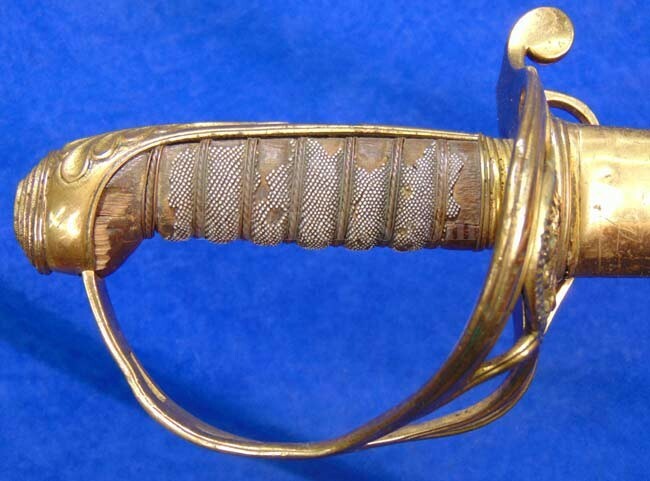 Here is an extremely scarce sword. 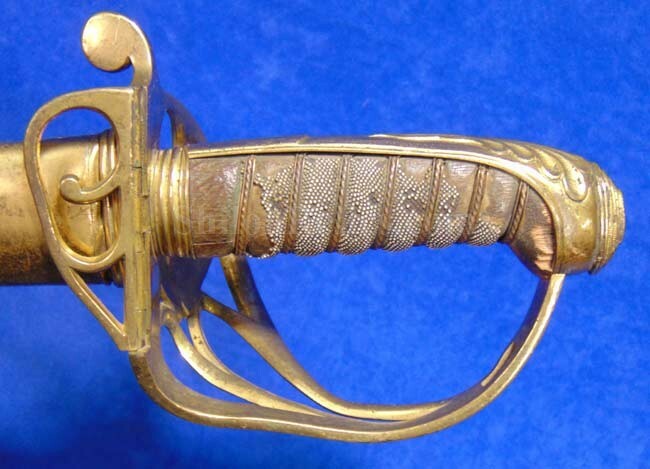 This is an officer's sword but when you look closely, this is a sword that was made for the Republic of Haiti. 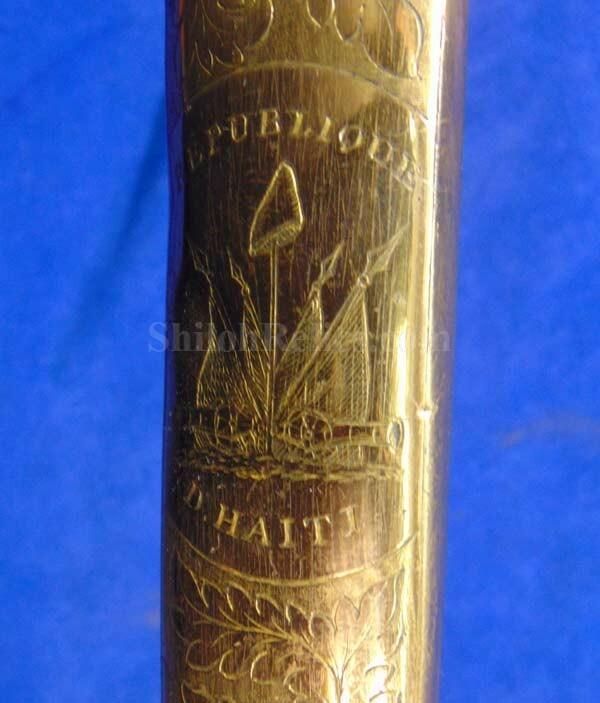 Judging from the construction it would have been used by the 2nd Haitian Empire from 1849 until 1859. 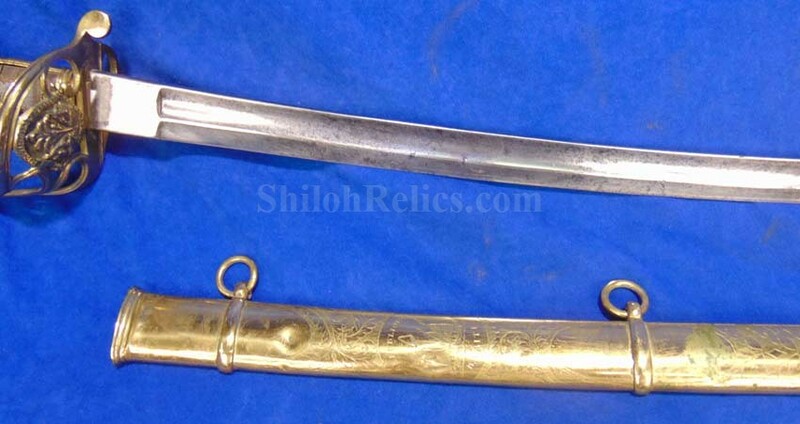 The blade still retains 31-1/4th inches of the original length. 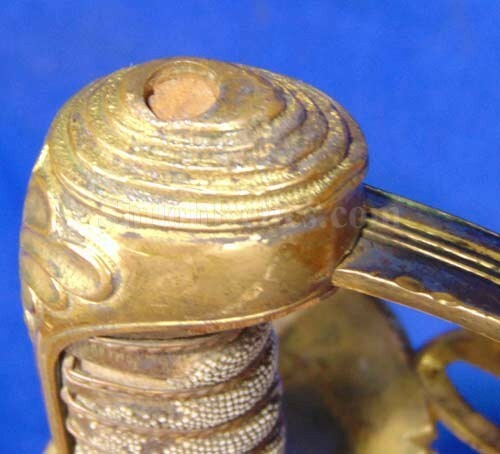 You can see that the tip end of the sword was reshaped so it could still be used. 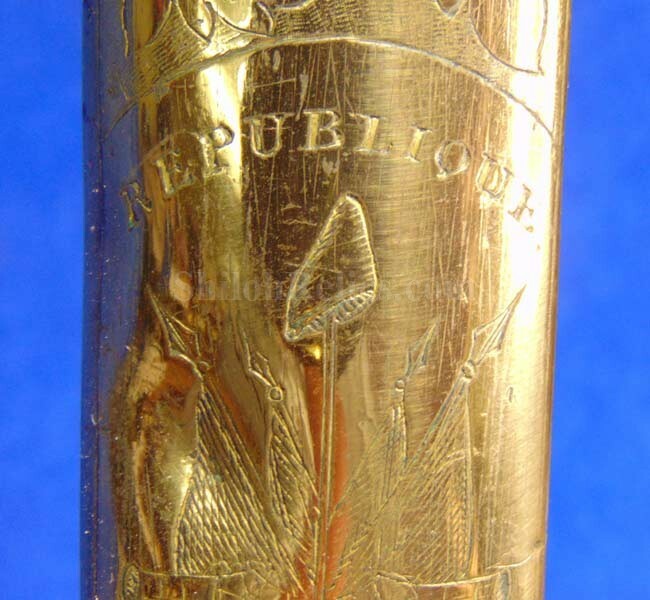 When you look closely you can see the very faint traces of the etching. 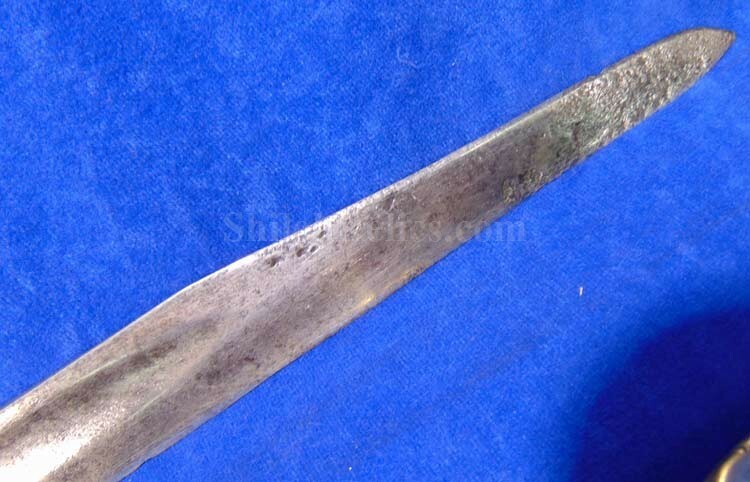 The blade is nice and wide at the base at 1-3/8ths inches. 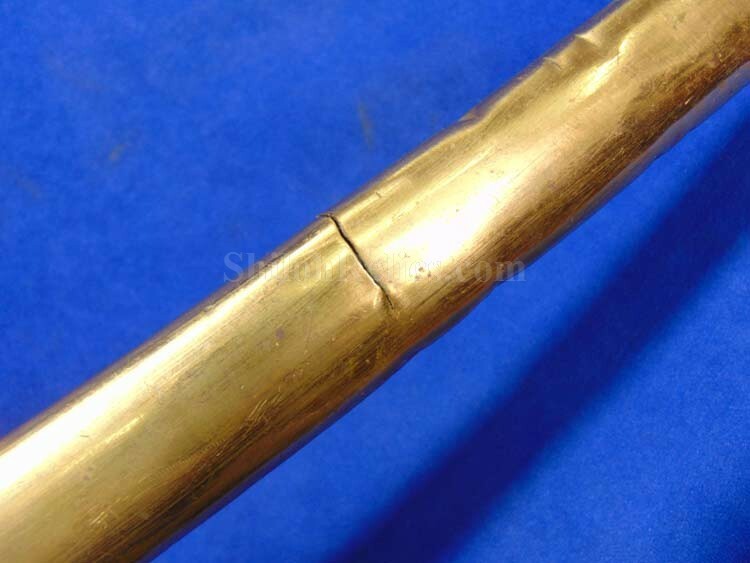 The handguard is very interesting. 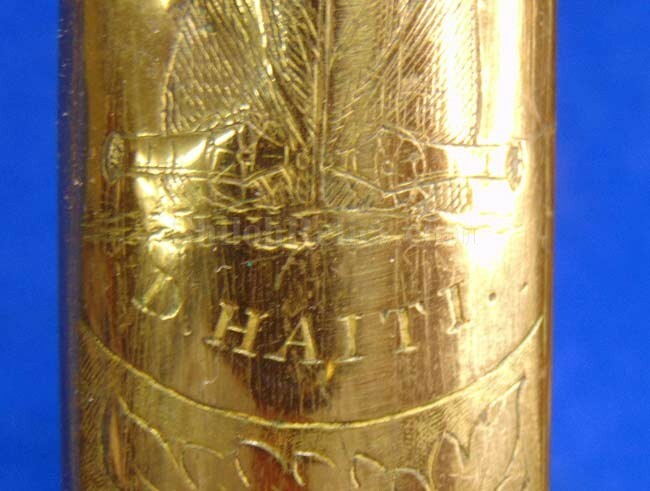 It has the Haitian coat of arms that shows the palm tree in the center with the flags and cannon on each side. 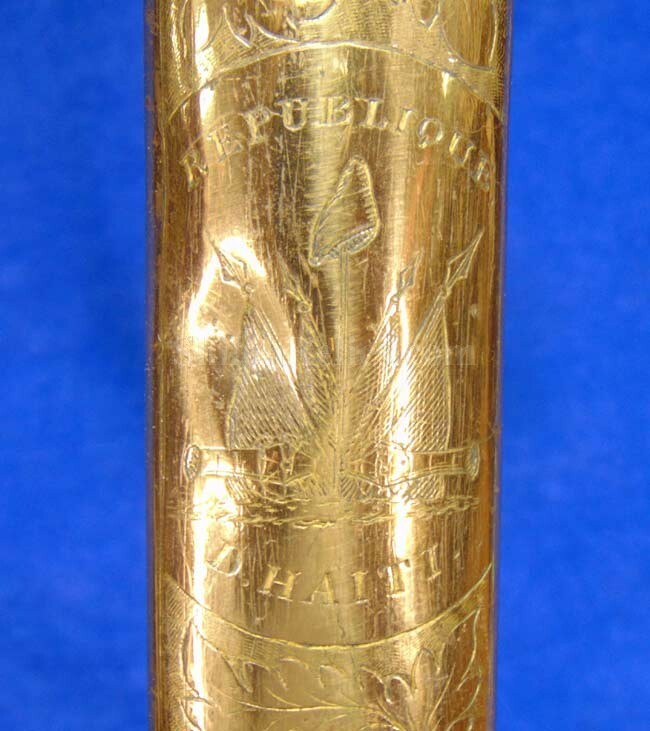 It has the "REPUBLIQUE D'HAITI" lettering. 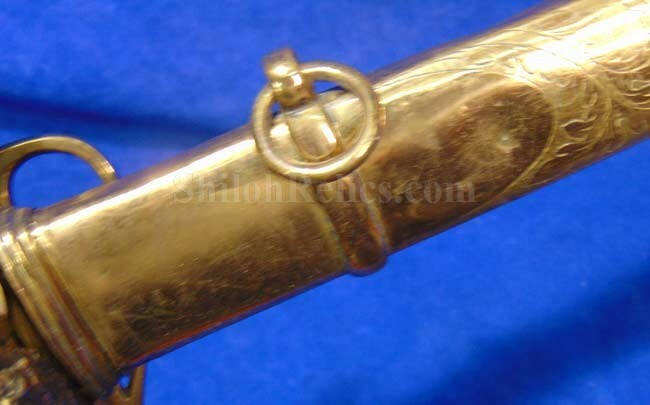 On the back side of the hand guard it has the folding portion that lets you know again that this was a high quality piece. 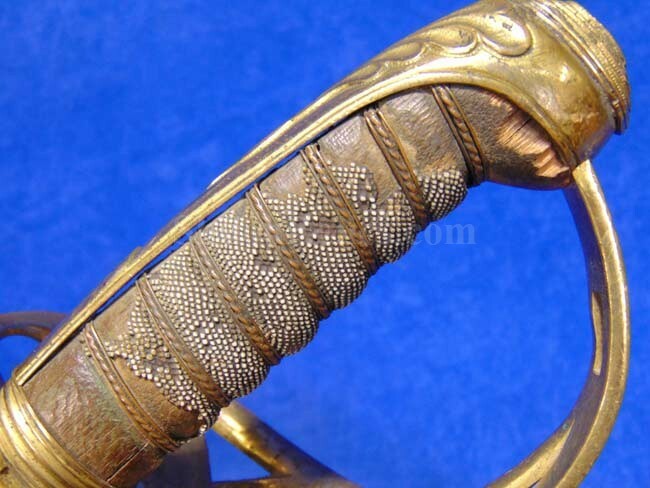 On the handle of the sword, it has the original wooden core as well as a fine amount of the original sharkskin grip. Wrapped around the handle it has the spring style copper wire and it is flanked on each side of the spring wire has the single strand copper wire. 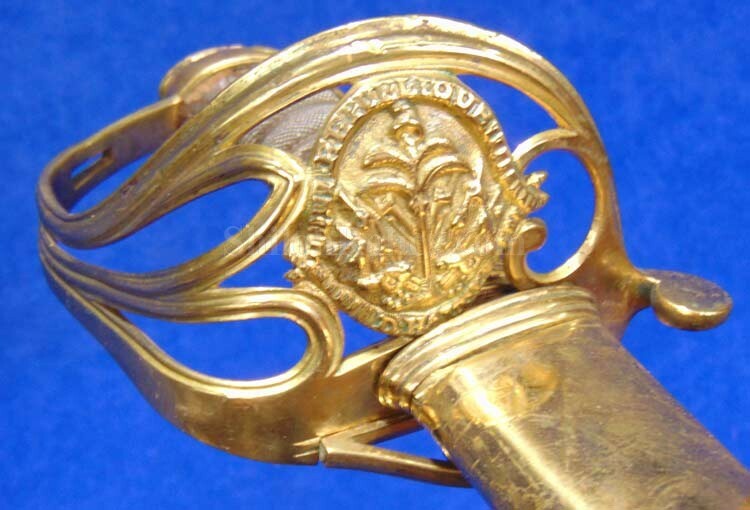 The sword is accompanied by the original scabbard. 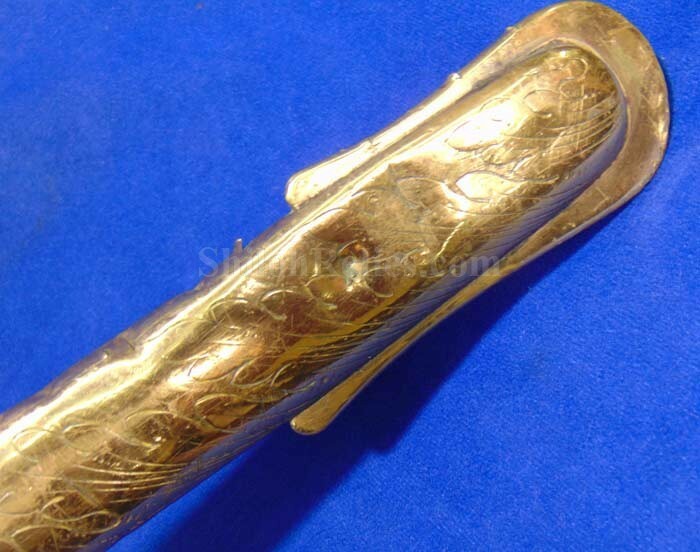 The scabbard is a high quality piece that is constructed from brass. 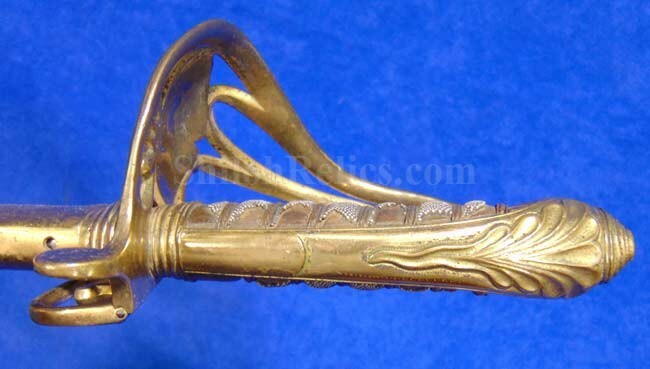 It has the original throat intact as well as the original drag and both mounts and rings. 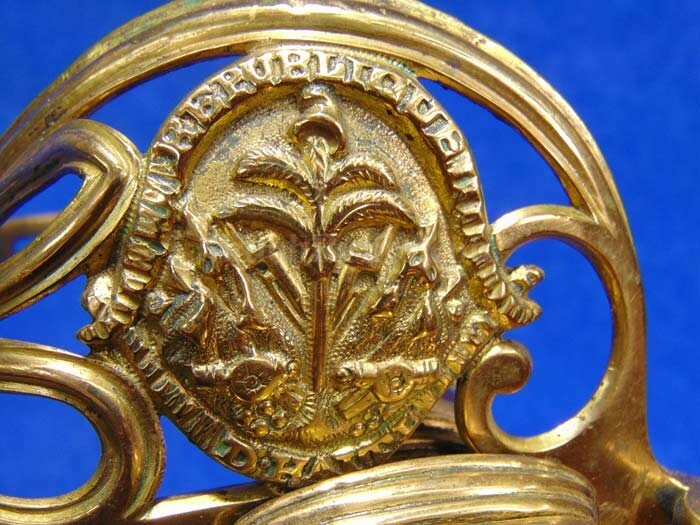 The scabbard has the ornate engraving that has the beautiful Haitian coat of arms that matches the hand guard. 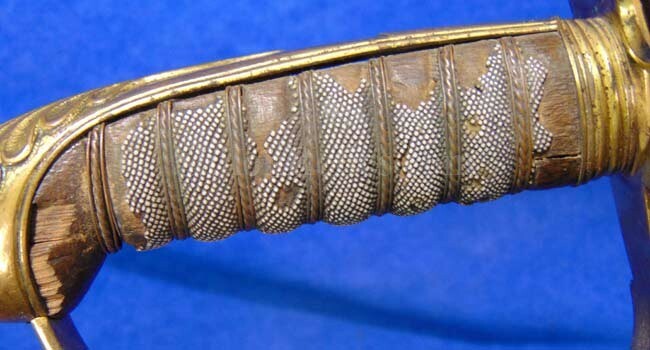 The scabbard has the wear as you can see. 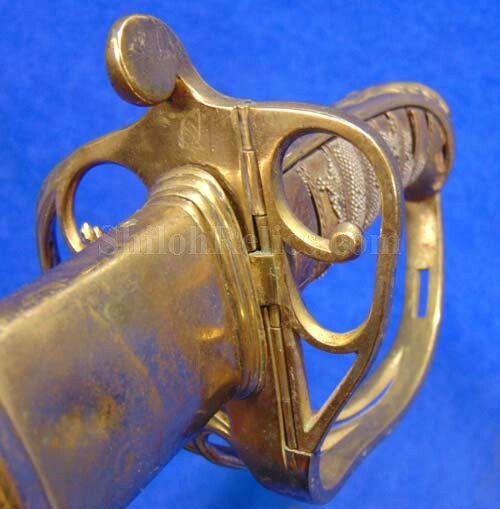 The wear lets you know that this sword saw a lot of service. 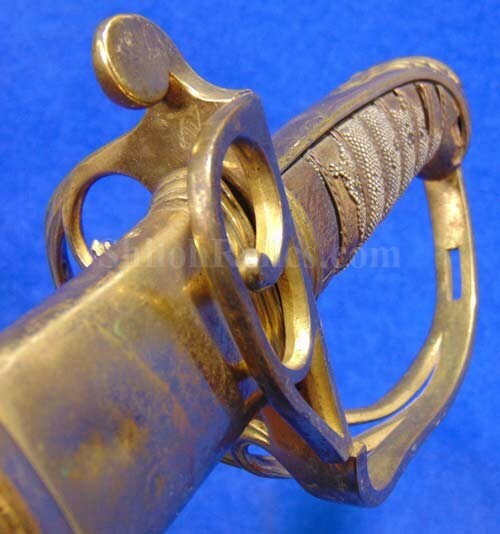 In our 25+ years in the business, this is the 1st one of these swords that we have been fortunate enough to offer. What a great piece!